Our review: An extremely pale straw in color, this wine has aromas of gooseberry, citrus flower, and fresh herbs. The fruit flavors are crisp on the palate, slightly tart, with a bit of minerality. The finish is very smooth, though without much depth. Our rating: We recommend serving this wine with a fresh green salad or seafood appetizers (like oysters or calamari). It should also pair well with a vegetable risotto, which is how we enjoyed our bottle. Clean and refreshing, we rate this wine on the high side of Above Average. 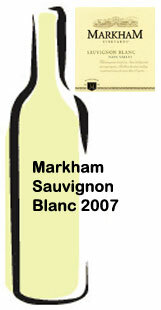 Taste profile from the winemaker: "Aromas of passion fruit are layered with honey and lemon-lime citrus zest. Floral highlights draw you in for the first taste, grapefruit and white peach flavors will keep you coming back for more. The clean, crisp flavors will balance with any meal, but grilled shrimp would shine."